With a shipping date of December 1st, the vehicles are close to being done, whether they’re finished or not. Spidertrax has completed the external roll cage, and included a few additional features at no extra cost. Justin Hardine custom built our roof racks, finishing the job welding the mounting brackets on in the middle of a snowstorm. Our thanks to Justin for his quick and high quality work. Alpine Rodman set up a painting booth in Graham’s garage to paint the roof racks (unfortunately there was not enough time to have them powder coated.) Once the racks were installed on the cars, we mounted the rooftop tents, and installed the Hella FF lights on the roof rack. We mounted an ex-military cargo box on the roof rack along with our high-lift jacks and shovels. Both trucks now have on-board air compressors installed. This will help us with tire repairs, as well as enabling us to air up the tires after reducing pressure to traverse a sandy section. Brian Slobe dragged us out of bed early one morning to take photos of us and our vehicles. On Monday, December 1, a 40’ shipping container was dropped off at Graham’s house. We hired a flatbed tow truck and loaded the vehicles on the tow truck one at a time. The tow truck then backed up to the container and we drove it in. Alpine and Graham secured four 10,000 pound ratchet straps to each vehicle to prepare them for their trip across the Atlantic. The vehicles should arrive in England on December 29. We will then have about a week’s worth of work fitting parts we couldn’t find in the US prior to our departure for Africa. The dual battery system in both trucks is hooked up and working properly. 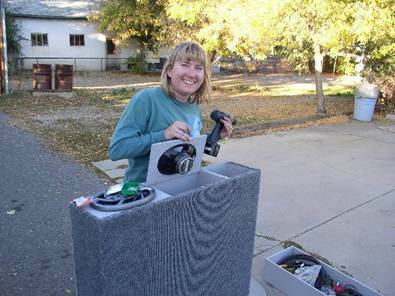 A new stereo was installed in both vehicles as well and the speakers were upgraded. The stereo will play MP3s recorded onto CDs, which should give us more listening time while taking fewer CDs. We installed Hella 4000 driving lights and Jen and Witt’s truck finally looks complete with a grill up front. Ed and Annette replaced the shocks on Jen and Witt’s truck and Graham, who is becoming more and more skilled with the welder, repaired a broken shock mount. 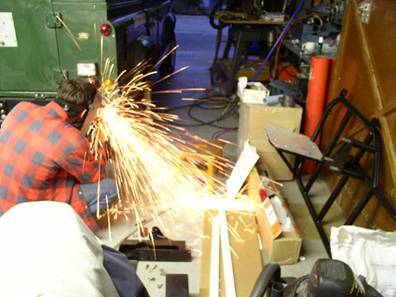 Witt is getting a little less nervous when he sees Graham don the welder’s mask and start to weld on his truck. Learning that “I’ll install a fuse as soon as I get everything hooked up and working” is a bad idea: priceless. We’ve hired Spidertrax, a small shop in Hygene, Colorado to build external roll cages for our vehicles. The purpose of the cages is to provide extra protection in the event of an accident, and to provide a stronger mounting point for our roof rack. Spidertrax is working on the cages during the week; we get the car back on the weekend. We are now working primarily on interior fittings and what has affectionately become known as “Stupid little electrical stuff.” I just hope that I can remember where all those wires go. 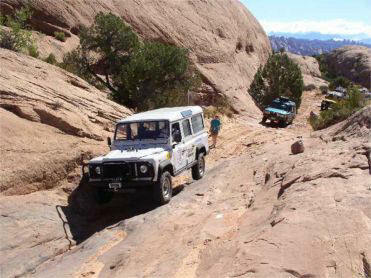 9/27-9/28 We installed Safari Gard rock sliders on Jen and Witt's vehicle along with a water tank for drinking water. We finished the task of hooking up the winch and Jen completed the re-carpeting of the interior and applied sponsor logos to the outside. Meanwhile Graham and Connie's truck got new springs and shocks up front, which gives it a much higher stance. During the week, Graham wired the Superwinch X9 that had been installed by Safarigard. On Saturday we installed a long range fuel tank in Witt and Jen’s truck. The tank fits between the fuel filler and the main fuel tank and sits just inside the right rear quarter-panel of the vehicle. Installation took Witt and Graham the entire day and left them both smelling of diesel fuel. The tank holds about 10 gallons, which brings the total capacity up to about 33 gallons. The truck has been getting 22-23 mpg, which gives us a total range of 600+ miles. With a couple of 5 gallon Jerry cans, we should reach our goal of an 800 mile range. Graham and Connie’s truck, which is newer (and comes with a plastic fuel tank! ), is not compatible with the same long range tank. We’ll have to come up with an alternate solution. We took both trucks to the National Land Rover Rally in Moab Utah. Both trucks performed flawlessly and we are all very happy with the progress so far. Witt and Jen installed a mounting system for two batteries underneath the driver’s seat of their vehicle. When wired, the dual battery system will cause the starting battery to be disconnected from the “house load” (refrigerator, lights, laptop computer, etc) when the engine is not running. This will allow us to use our electrical accessories without fear of draining the main battery. More on this project as it progresses. Witt drove his truck to the Colorado emissions technical center to find out how to get an emissions test for his truck, since there is no facility in Colorado that can test a full time four wheel drive diesel vehicle. The man running the testing facility came outside, looked at the tailpipe while the engine was running and said, “looks okay to me.” Emissions test done. Connie and Graham flew to California and drove their truck back from Safari Gard. The whole team picked up the parts for Witt and Jen’s truck. By the end of August the truck was running and in great shape! Connie and Graham picked up their Land Rover and took it to Safari Gard in Southern California for outfitting. Witt, Jen and Graham attended the Royal Geographic Society Explore 2002 conference in London. This conference is a treasure trove of contacts and information for those planning expeditions in remote locations. It is geared mainly toward scientists doing field research, but is open to anyone with an interest. We attended talks on overland planning and logistics, desert and savannah and tropical forest expeditions, earth sciences in expeditions, GPS/GIS mapping and recording expeditions in words and images. We came away with the Royal Geographic Society book on Expedition Medicine as well as contact with other groups planning on heading from London to Cape Town around the same time we are. I'm sure we'll see them on the road and swap ideas before we leave. The conference is a great source of information, inspiration and contacts. See www.rgs.org. Land Rover Flatirons in Superior, Colorado reiterated their support for our trip by placing a link to our site on theirs. See them at www.landroverflatirons.com and on our sponsor page. They have agreed to give us tire rack mounts for both trucks. 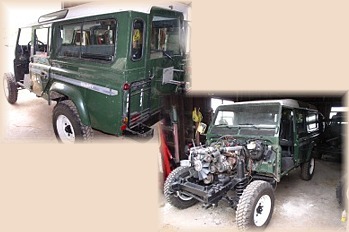 Land Rover World has agreed to cover the build story of our vehicles in their magazine. So watch LRW early next year for our story!